The California State Transportation Agency awarded $51.9 million in State Rail Assistance program funding to seven recipients. The funds are made possible by the passage of state Senate Bill 1 (SB 1) last year. SB 1 created the State Rail Assistance Program by directing a portion of new revenue specifically to intercity rail and commuter rail. The majority of program funding is directed by statutory formula to rail operators. The legislation is expected to provide $7.6 billion in new transit funding over the next decade. • The Capitol Corridor Joint Powers Authority received a total of $13.1 million for four projects including safety and security improvements, the replacement of the passenger information system, rail and station infrastructure improvement environmental and design work and signal replacement. The Sonoma-Marin Area Rail Transit received $10.5 million to provide additional SMART service. Metrolink received $10.5 million for signal modernization. The North County Transit District received $10.5 million to acquire seven Tier IV, low-emissions locomotives. The Altamont Corridor Express received $2.5 million to initiate weekend service. 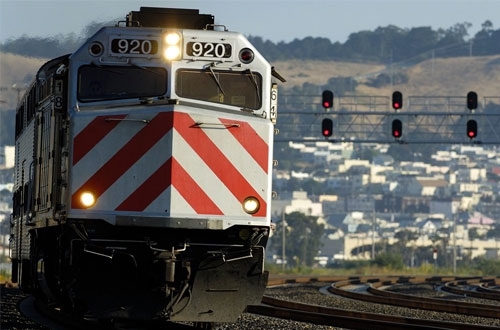 Caltrain received a total of $2.5 million for three projects including vehicle rehabilitation, control point work and initiating a bike parking program. The Los Angeles – San Diego – San Louis Obispo (LOSSAN) Rail Corridor Agency received a total $2.32 million for five projects including platform emergency repair, interregional connectivity improvements, corridor optimization software, LOSSAN Corridor strategic plan update work and an extension of the Leesdale siding. The agency says the projects have a total value of $136 million with funding from other sources included and are focused investments by the state to improve commuter and intercity rail service across California, reduce air pollution and ease traffic congestion.